Mik and I enjoyed the Who Wants to be a Mouseketeer? 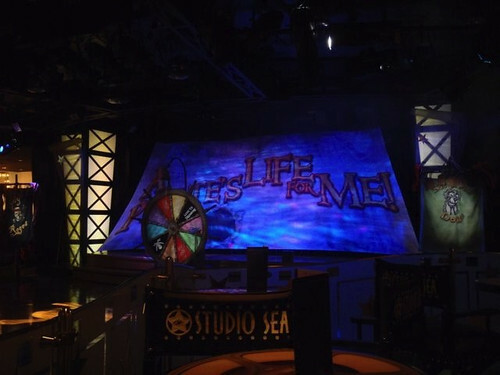 game show, so thought the Pirate's Life for Me game show would also be a fun evening activity. Instead it was a much younger geared game show that was excessively noisy. Different kids were chosen to participate in the game shown including extras chosen during the mini games. However, since the kids club only about half came from the family audience. 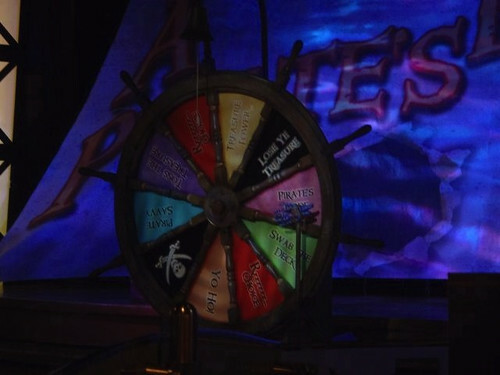 The games are chosen by spinning a wheel, so maybe they vary from show to show. The first game they did was called Swab the Decks. In this game kids from each team pushed a bucket around with a mop in it. The second part was the best because everyone could easily participate. It was called Guess the Pirate. The tv screens would show a picture of a pirate and the team would run up to tell the First Mate and then the Captain would ring the bell to guess. The final game involved throwing coins into the bucket being held by the First Mate. Everyone could participate in this, but trying to get in line and then back around with Mik in his wheelchair was too much of an effort with the close tables and everyone crowded around for the game. Overall we were very disappointed with a Pirate's Life for Me. It is more interactive than the other ones, but it was extremely noisy with them continuously having everyone chant and yell. Also, it was active interactive and we had more fun with the quiz game shows we did not get picked in because at least we could whisper guesses to each other.